The Sea Gypsies of the Andaman Sea have been sailing up and down the west coast of the Malay Peninsula for hundreds of years. Traditionally living on their Kabang (self contained houseboats) and trading sea slugs, pearls, shells and bird’s nests for life’s necessities, many sea gypsies have now begun to settle permanently, and abandon their nomadic culture. Some like the Moken, continue to move between the islands, their ocean territory becoming ever more threatened by expanding tourism in Thailand and political repression in Myanmar. 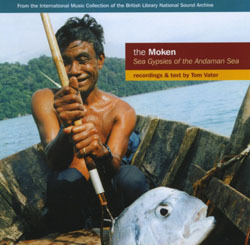 The Moken’s music collected on this CD, recorded on a deserted beach between surf and jungle, is wild and unpredicatable, full of warmth and drama and yet as detached from our world as their hard, uncertain sea-faring lifestyle.